With the release of Windows 8.1 to the world in October, Microsoft in November saw the first full month of availability for its latest operating system version. So far, the result has been mixed: while Windows 8.1 is certainly growing quickly, and eating rather effectively into Windows 8’s share, the duo hasn’t moved forward very much overall. The latest market share data from Net Applications shows that November 2013 was a slow one for Windows 8 and Windows 8.1 combined, gaining just 0.05 percentage points (from 9.25 percent to 9.30 percent). More specifically, Windows 8 fell 0.87 percentage points (from 7.49 percent to 6.66 percent), its second loss ever, while Windows 8.1 jumped 0.92 percentage points (from 1.72 percent to 2.64 percent). At the same time, Windows 7 grabbed 0.22 percentage points (from 46.42 percent to 46.64 percent). 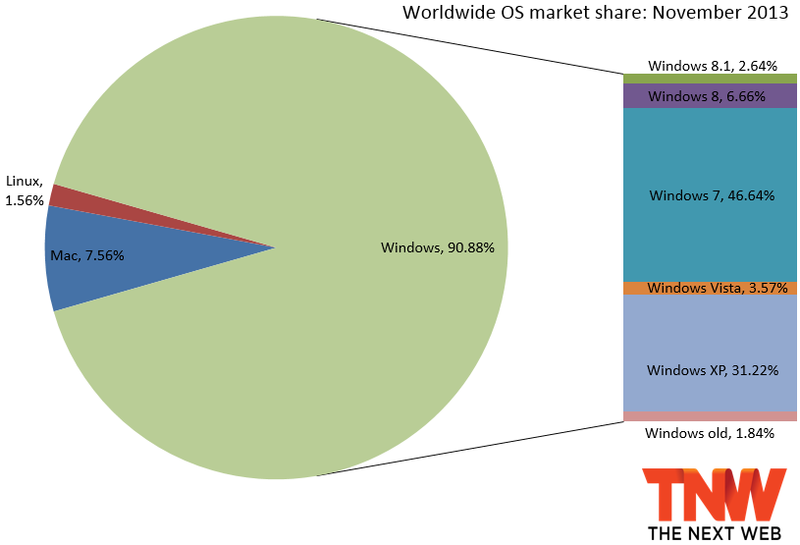 In November, Windows 7 thus managed to gain more share than Windows 8 and Windows 8.1 combined. Windows 8, which saw its biggest gain in August at 2.01 percentage points, now has a new low month: losing 0.87 percentage points in November. It will likely continue to slip, given that all Windows users are being encouraged to get the latest and greatest, and Microsoft is making the upgrade path to Windows 8.1 just a download away. Nevertheless, the gains of Windows 8 and Windows 8.1 combined are pitiful. Even Windows Vista, which declined 0.06 percentage points (from 3.63 percent to 3.57), moved more percentage points during the month. Meanwhile, Windows XP barely faltered: dropping just 0.02 percentage points (from 31.24 percent to 31.22 percent). We’re still expecting it to fall below the 30 percent mark for the first time in years, though that may not happen in 2013. So far this year, Windows has lost share every month except for March, July, and November. This past month, Windows gained 0.22 percentage points (from 90.66 percent to 90.88 percent). This gain was OS X’s and Linux’s loss: down 0.17 percentage points (to 7.56 percent) and 0.05 percentage points (to 1.56 percent), respectively. Net Applications uses data captured from 160 million unique visitors each month by monitoring some 40,000 websites for its clients. StatCounter is another popular service for watching market share moves; the company looks at 15 billion page views. To us, it makes more sense to keep track of users than of page views, but if you prefer the latter, the corresponding data is available here (Windows 8 is at 7.52 percent).